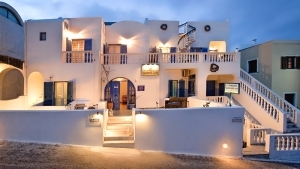 Philippion Boutique Hotel is a 4 star hotel located 250 metres from Fira Town center, enjoying views of Fira Town, the caldera and the Aegean Sea. It offers an outdoor swimming pool with free umbrellas and sun loungers and free Wi-Fi internet access throughout. Featuring built-in beds and traditional decoration, all rooms are air-conditioned and open to a veranda overlooking Fira Town or the garden. They come with a private bathroom, a flat-screen TV and hairdryer. 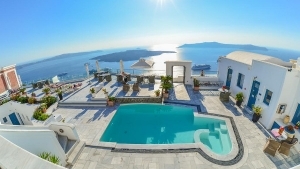 Some rooms have views of the volcano and the Aegean Sea. A buffet breakfast is served for guests and they can continue with other meals at the on-site restaurant. Cocktails and refreshing drinks are served at the bar. The 24-hour desk can arrange for car rental to explore the beaches of Perissa and Kamari which are at 10 km distance from the hotel. 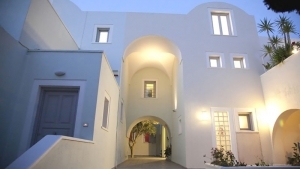 The property is located around 11 km from Oia village and 10 km from Port of Athinios. Transfer from Santorini International Airport is provided for free. 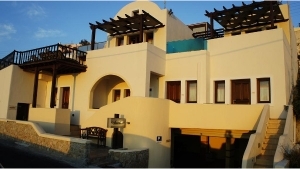 Restaurant, Bar, 24-Hour Front Desk, Newspapers, Garden, Safety Deposit Box, Soundproofed Rooms, Heating, Luggage Storage, Air Conditioning, Sun Terrace. Activities: Massage, Outdoor Swimming Pool (seasonal). Services: Room Service, Airport Shuttle, Laundry, Dry Cleaning, Breakfast in the Room, Ironing Service, Currency Exchange, Bicycle Rental, Car Hire, Tour Desk, Fax/Photocopying, Trouser Press.